Zhoozhitzu do Graugardo: Got black belt, still no signs of invincibility. Got black belt, still no signs of invincibility. When I started grappling in 1999 and first got interested in Brazilian Jiu Jitsu, black belts were in my mind, someone with superhuman powers and skills. They were basically invincible. I am a bit disappointed to find out it was all just an illusion, since I still feel pretty human today. I have trained in martial arts, since I was seven years old. This is the first black belt I have gotten, and the only one I could imagine wanting to have. It embodies the sum of all my experiences, during a lifetime of training. Every single training I have ever done, and every single person, who has crossed my path on the way (that includes YOU), has shaped me and lead me to this moment in my life. One person, in particular, who has had a big influence on me over the last few years, has been Robson Barbosa. Inspired by his down to earth approach to life, Jiu Jitsu and training, combined with a burning passion for accomplishment and competition, he has given me the push I needed, to take my game and coaching to the next level. This weekend, I was pleased to meet his own trainers, Edson and Ricardo Carvalho, who seemed to be exactly like him. It was an honor to receive my black belt from them. Next time I step on the mat, it is like a fresh start for me. I have graduated school, now it is time to go to work and make something out of my life with the tools, I have acquired. Competition will be like being a white belt again. I am now in the absolute bottom of the food chain, about to fight for survival against primates, who have been evolving for generations ahead of me. Winning seems impossible at this point, but I know the recipe to make it happen. It is the same, simple formula, that got me to where I am now: Just keep trying. 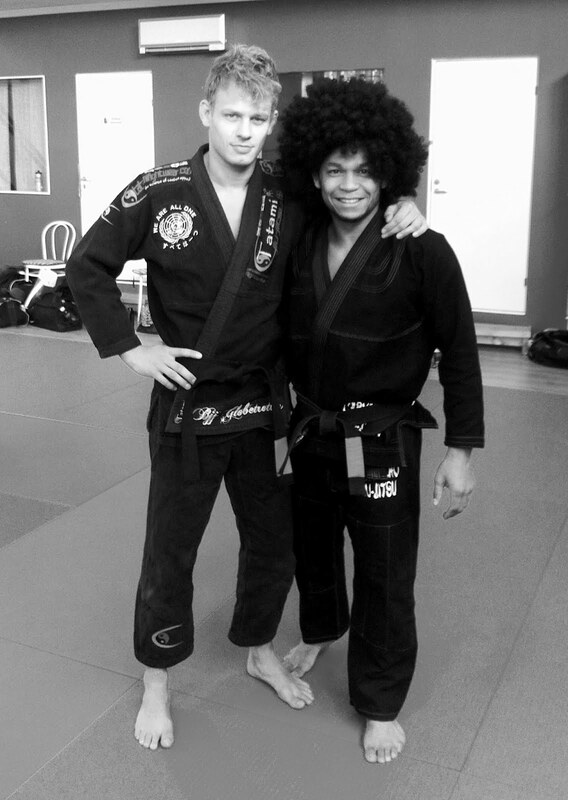 With the accomplishment of becoming a black belt in BJJ, comes great responsibility. Our sport sets extremely high standard, and I feel like I have a lot to live up to, both in terms of my own performance as an athlete and in being a good role model for anyone who choses to train with me. Big ups, congrats, very well deserved. Very awesome man! You attitude and humble approach is so inspiring. Thanks for sharing your experiences with the world.